Manufacturers and purchasers of electric and hybrid vehicles are some of the big winners in the stimulus package which Congress passed last month. The bill includes both tax cuts and outright grants. Next year, for example, the purchasers of the first 200,000 cars sold by each manufacturer will be able to take a tax credit for the first $7,500 of the car’s purchase price. The manufacturers will be offered $10 million in loans for “advanced vehicle” research. They will also be able to deduct up to 30% of their research expenses. $400 million in grants will go to local governments to improve “charging infrastructure” and buy electric and alternative fuel vehicles for municipal fleets (Stimulus Bill). The bill is one of the biggest packages of electric vehicle aid in history. It is part of a long series of aid packages, tax cuts, and special treatment given to the alternative vehicle interests. Alternative vehicles are fashionable these days, but are they good public policy? An efficient, low-emission car is still a car. As a technology, cars have numerous serious drawbacks which have nothing to do with gas mileage for emissions. It is easy to listen to the hybrid hype or buy into the pre-packaged utopian visions of electric vehicles. To do so, however, requires ignoring a number of basic problems. Cars pollute and consume at every stage of their life cycle, not just when they are being driven. The factories themselves are powered by coal-burning electrical plants. Like every large scale manufacturing enterprise they pollute the air and produce solid waste at an alarming rate. It has been estimated that “By the time a car leaves the assembly line, its manufacture – including extraction and transport of the raw materials that go into it – has generated 29 tons of solid waste and 1,207 million cubic yards of air emissions.” (Alvord 84). The completed cars are usually shipped thousands of miles to a dealership by big, dirty freighters and trucks. A car continues to consume fresh water, lubricants, and other resources throughout its life. Some of these can be recycled but it is an energy intensive process. When a car is worn out (often after only ten years or so) it is crushed so its metals can be extracted. Everything else goes straight to the landfill. Modern cars have a lot of plastic parts, few of which can be easily recycled. Every one of these environmental objections is as true for an electric car or a hybrid as for a conventional car. Cars need roads to operate. Busy roads divide neighborhoods. They are a hazard to pedestrians, bicyclists and animals. Electric vehicles are even more dangerous than conventional vehicles because they are so quiet. Furthermore, large paved surfaces create their own environmental problems such as point source pollution, urban heat island effects, and toxic run-off from road deicing. From an aesthetic point of view, freeways and parking lots are simply ugly. Many people argue that we simply can not live without cars. They claim that cars are a necessary evil. Thy claim that people will never give up cars, so the government needs to support the development of the cleanest cars possible. This argument does not hold up when you consider than no other county in the world uses cars as much as we do. In fact, the only reason cars have such a hold on American culture is because our government has been subsidizing roads and automotive companies for the last century. If the government ceases to support cars, then people will quickly learn that they do not need them so much. Even in this country many people live quite happily without a car. Others use their cars only on weekends or share a car with someone else. In other countries most people ride bikes, walk, or take trains. Rather than funneling money into the latest fad in automotive technology, the government should be supporting grants for neglected areas such as public transportation, bicycle safety education, and urban planning for walkable neighborhoods. Every dollar spent to subsidize alternative vehicles is a dollar that can not be spent elsewhere. Other transportation options can be a far more efficient use of the same money. Public transportation vehicles like buses and trains are just as damaging to manufacture as cars. However, they last much longer and serve more people. A typical hybrid car is used by a single person to get to work, where it then sits idle all day until it is time to go home. A train or bus, on the other hand, is generally in constant service for twelve or more hours a day. Trains carry hundreds of passengers and buses dozens. Many car commuters can not even find one other person to carpool with them. When the resource cost of various vehicles are amortized over their useful life or the number of people transported, all passenger cars are many times as expensive as public transportation. Public transportation also takes up less road space than individual passenger cars. A simple two-lane bus-way can carry more people per hour than the largest freeways. Train tracks are much narrower than roads. Neither cars nor buses require a parking lot in the sense that cars do. Public transportation is more efficient than private car ownership in every way. Lovers of hybrids and electric vehicles would do well to remember that all trains are electric. Light rail trains run directly off of the city power grid while larger trains are hybrids. A diesel generator creates energy to run the electric motors in the wheels. Hybrid busses are becoming viable. Those that burn clean alternative fuels are already common. The Metropolitan Transit Authority in Los Angeles, for instance, runs mostly natural gas buses. Even public transportation, as efficient as it is, can never compare with bicycles. Bicycles are human powered. They produce no emissions, encourage public health, and last nearly forever. A strong cyclist can haul hundreds of pounds of cargo in a trailer or rickshaw. Unfortunately bicycling receives very little funding (almost none at the federal level). American highways are designed in such a way as to be very dangerous for cyclists. Dedicated bike paths are usually poorly maintained and often go nowhere. An investment in cycling infrastructure would go much further than an investment in electric vehicle recharging infrastructure. Likewise, the government should be giving tax credits to people who buy bicycles, not hybrids. Since bicycles are so much cheaper, the money could be used to help many more people. Government aid for alternative vehicles is a misuse of money. By encouraging people to buy hybrid and public cars, they are really just encouraging cars in general. By telling people that it is alright to drive as long as they drive an electric vehicle, they are really telling them to ignore all of the other horrible environmental impacts of automotive technology. If the government insists on funding transportation, it should put the money into things that will actually help this country like trains, buses, and bike paths. Alvord, Katie. (2000). Divorce Your Car. Gabriola Island: New Society Publishers. Every few years a technological revolution comes along that completely changes the construction and architectural world. The current development is something called Building Information Modeling (BIM). While the theoretical principles behind BIM have been around for decades, it has only been widely adopted in the past couple of years. These days you would be hard pressed to open a construction trade journal without seeing a reference to it. In essence, BIM consists of creating a very detailed database of an entire construction job during the design phase. Literally every single piece of the job has an entry containing its size, position, color, model number, and structural properties. This includes structural members, pipes, wires, finish elements, mechanical devices, furniture, and every other component. The process is often likened to “virtually” constructing the building on the computer. The software uses the database to generate all of the plans that are needed for field use and approvals. This stands in contrast to traditional drafting techniques where a draftsman prepares each page separately with drafting software. BIM software is not limited to 2-dimensional plans, however. Today’s systems can generate a full 3-dimensional virtual reality model. The software is sophisticated enough that it even puts in the correct lighting for a specified time of day. Because the software also keeps track of the project schedule, it can render the job at any phase of construction, not just completed projects. The advantages of these systems promise to be enormous. The amount of the information contained in the model allows for very complex analysis. For instance, many BIM systems contain tools for structural analysis that can save the structural engineer many hours. The architect can do lighting and energy analysis. In the past lighting design has required a lot of guesswork. Any good BIM model can provide the exact number of lumens at any point in the building at any time of day. Mechanical designers can model air and water flow throughout their systems. The energy efficiencies which can be realized simply by engineering improvements are huge. Many green building advocates are in favor of BIM technology simply because of all the electricity it can save. BIM is a great tool for estimating as well. Actually, in a manner of speaking it is not even estimating any more. Knowing the exact amount of concrete, lumber, or any other material is a matter of a few clicks. Any construction manager knows that you can save a lot of money by having the right amount of materials available at the right time. BIM will make it much easier to do just that. Perhaps the most important benefit from BIM comes in at coordination time. Even small buildings are often designed by dozens of different professionals. The architect draws the overall building but consultants design subsystems such as electrical, heating venting and air conditioning (HVAC), fire sprinklers, and many more. The consultants then meet with their plans and “coordinate” them to make sure that their various lines, pipes, conduits, and ducts are not running into each other. The idea sounds simple but coordination can often take weeks. Even then, some “crashes” slip through. Often conflicts between mechanical systems are not discovered until installation time, resulting in wasted hours of labor, reordered materials, and completion delays. With BIM coordination is easy. Every building system is in the same database. The job is rendered in 3D and it is obvious to everyone when systems are in conflict. Some of the programs even have a function to flag all the crashes. I still remember the first time I did a BIM job. The general contractor plugged his computer into a big-screen TV and suddenly we were looking at a beautifully rendered version of the parking structure we were building. He scrolled along and showed me two places where my pipe was running into beams and one where the plumber and I were trying to run pipe in the same place. The incident was embarrassing, but it made me a believer in BIM for coordination. It only took me a few minutes, back at the office, to move my pipes. If the problems had made it all the way to the field we would have needed to tear out thousands of dollars worth of pipe while the other trades waited on us. BIM technology seems wonderfully useful and powerful. There can be no doubt, however, that it is going to change the whole construction world. The advantages of BIM are only available if every company on the design team has the hardware, software, and training to use it. A basic computer workstation for BIM costs nearly twice as much as an ordinary drafting workstation (somewhere around $10,000). Actually the price tag is higher because no one BIM software suite dominates the market. A contractor needs to have copies of the software used by every other company it works with (at $6000+ per copy). For many small companies this is just too much to spend. Some of them even still draw jobs by hand. BIM will leave them behind. They will be forced out of the ground-up construction market entirely as contracts go to bigger, more technologically advanced companies. I have already seen construction contracts that require the contractor to have and use a particular type of BIM software. This is probably a growing trend. Small construction companies have always brought energy and ingenuity to the industry. It will get harder for small companies to break into the industry and harder for existing small companies to stay in. The big established companies will have the advantage, which could all too easily lead to stagnation. As the equipment gets more advanced, the knowledge required to run it also increases. In the past many construction managers and designers came up from the trades and learned to design on the job. Construction jobs that use BIM are so complex, though, that people with advanced degrees have a real advantage. As time goes on and ever greater education is required for these jobs, we will see massive professionalization of the construction industry. This is good in that it will ensure high pay and standardized training for people who do highly technical, life critical work. It is bad because it will deepen the gulf between the building trades and the building professions. Tradesmen will have less and less idea of what goes on “upstairs in the engineering department” or why they do things. Meanwhile we will see a generation of managers and engineers with very little job-site experience. The construction engineer will go from being a master builder to being a master computer programmer. The possible adverse effects of BIM technology could create real problems. Even so, the likely advantages are sizable. The industry is investing a lot of time and money into BIM and it is likely to be a powerful force in the construction world from now on. I have a confession to make. I write about the evils of cars. I hate the automobile and try to have as little as possible to do with it. Despite these facts, I have owned a car for most of the last year. I had plenty of justifications. 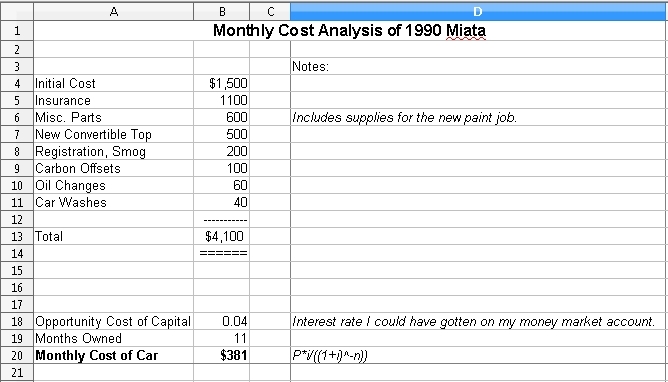 The car, a 1990 Mazda Miata, is just about the most minimalist excuse for a car that I could get away with. It is small, fuel efficient, and used. I offset all of the emissions through Carbonfund. It seemed like I needed it for work. After all, I need to visit job sites in six counties. Of course, all of these arguments are complete hogwash. Cars are dangerous and destructive. They consume space and money and make you lazy. Getting a car “for work only” like an alcoholic deciding it is OK to drink as long as it’s just beer. Naturally I soon began using it to get to night school. From there is was a short leap to driving on the weekends. Lucky for me, some higher power decided to intervene. Yesterday the Mazda blew a head gasket. I am not going to fix it, even though I have the skills and tools. I am not going to replace it, either. Car ownership is a dangerous trap. The hypocrisy ends here and now. I already ride the bus to school and use my bicycle for errands. I am training for a century ride right now anyway so I can use the miles. Now from now on at work I am going to use company trucks for company business or else I will not go at all. I am car free and I plan to stay that way. I just realized that this is my first post of 2009. Incredible! It looks like I never finished the last post, either. 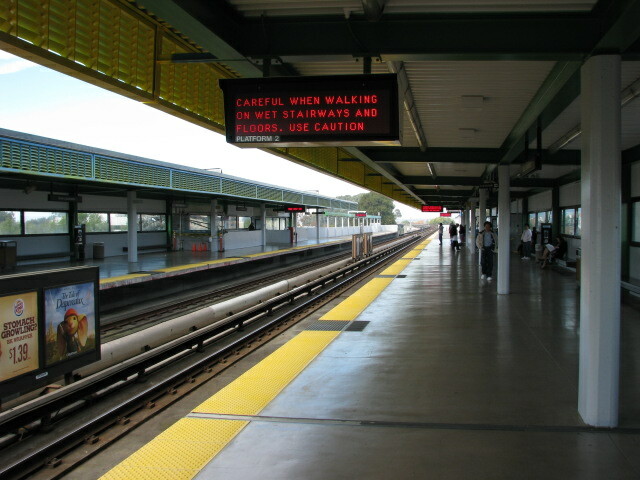 I meant to put in a few pithy paragraphs about the BART system with its live station attendants and ample bike lockers. Bring lots of change, though. The machines are impossible. I probably would have mentioned something about how busy the historic city buses in SF are and/or posted some pictures from when we rode the antique cable cars. Of course I never got around to any of that, so you will just need to use your imagination. The simple explanation for my long hiatus is that I have been doing a lot of writing in other (less anonymous) venues. After writing all day, coming home to write the blog just did not seem like much fun. I can not stay quiet for long, however, about the transportation problems that this country faces. I am back, and I am ready to rant, so look for more posts in the near future.